Collector’s Edition comes with the slipcase, a poster, a limited edition Eric Cash print, a replica of a historic Beatles promotional card and a bookmark. Paul McCartney has discussed the composition of this famous Beatles song on several occasions. As we report in Beatles for Sale on Parlophone Records, he borrowed the piano work from “Bad Penny Blues,” a Humphrey Lyttleton song. Where did he get the inspiration for the lyrics? Bruce Spizer’s Beatles history books have been marvels of information for detail-obsessed fans like us. His latest, “The Beatles For Sale on Parlophone Records” (also available online in the UK, Canada and Japan) is no exception. Co-authored with Frank Daniels, it goes into the history of the Beatles on the label and features lots of detailed information, like extensive pictures of cover and label variations. Those variations aren’t surprising, as Spizer told us in an interview earlier this year, because the British have been known to tweak labels and covers. The pictures in the book also include albums, EPs and singles, ads, magazines with Beatles on the cover, album parodies and even a few bootlegs (including the “Get Back” bootleg that included a poster, press release and mailing label (with canceled stamps). The book even includes a section on the history of the label, how the records were made and album covers and inner sleeves and a checklist. There’s so much here it’s mindboggling. This and his other books belong to a select group of pivotal reference works that are musts for an essential Beatles library. “The Beatles For Sale on Parlophone Records” fits in perfectly on the shelf with his other books. Spizer chronologically works his way through the 45 rpm singles, then the LPs, then the EPs and finally includes a section that covers a range of related topics, from histories of EMI and 33 1/3 rpm longplaying albums to trail-off area markings on vinyl LPs, the printing of labels, demo discs and Palophone’s sister EMI labels. For each recording you get the release history, quotes from reviews, interesting notes about how The Beatles wrote the song and created the recording in the studio, how the label promoted and marketed the record and, of course, this being Spizer, everything you could possibly want to know about all the different release variations. If you’ve collected Spizer’s earlier efforts, you’ll definitely want this one. And if you’ve never delved into one of Spizer’s discographies, you might want to make this your first, as it covers the entire period from 1962 up through the breakup in 1970. 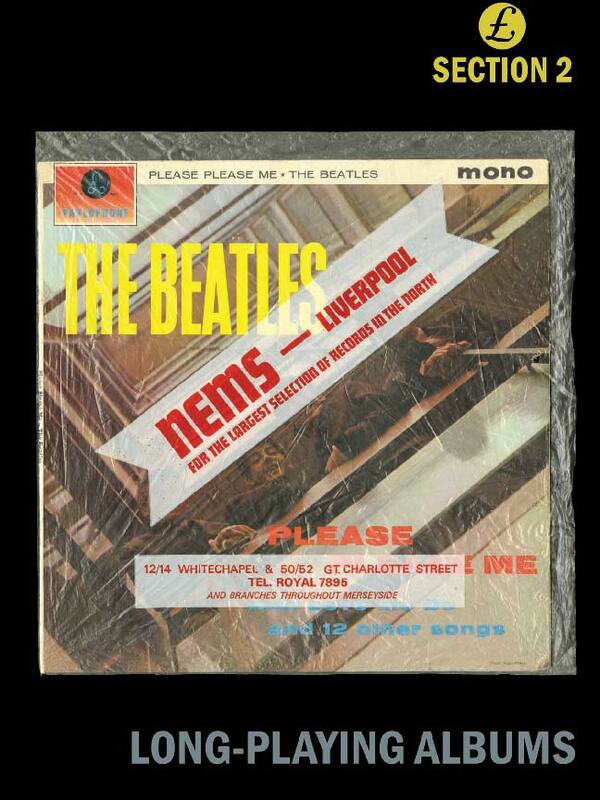 I don’t know of a better single-volume history of The Beatles’ recordings. 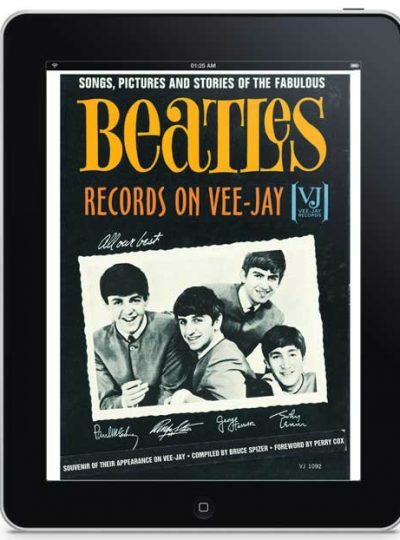 I’ll never forget my initial reaction to learning about Bruce Spizer’s book The Beatles Records on Vee-Jay: “Big deal”. I mean, how much could be written about a label that cut and pasted barely a dozen songs into nearly as many compilations and configurations. Had the well really run dry on Beatles topics to explore? Then I received the book as a gift. And found it really WAS a big deal ! Suffice it to say, the author’s research efforts set a new standard for Beatles scholars. Not only was the book chock full of new information and never before published images, but it was handsomely presented and a thoroughly enjoyable read. 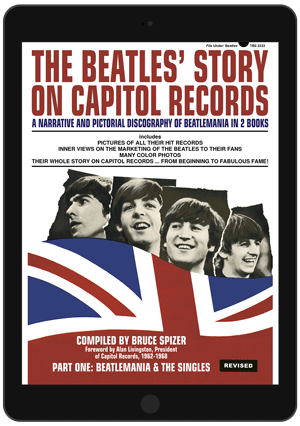 Spizer’s other books about the Beatles records on Capitol & Apple, as well as other related volumes maintained and at times exceeded that standard. 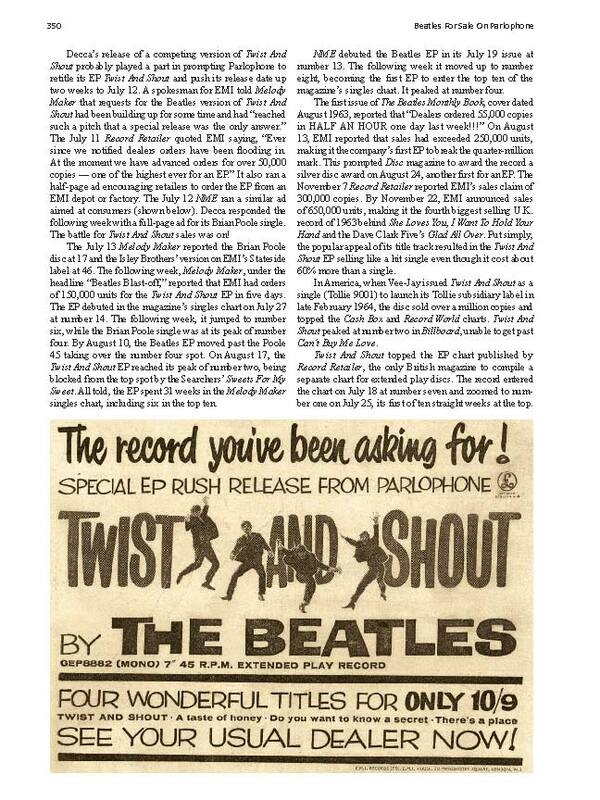 Fast forward to Spizer’s eighth and latest book Beatles For Sale On Parlophone Records. While previous books had a decidedly American take on the Beatles catalog (one that has made for great banter vs. the “purists” defending the UK catalog), this volume examines the home-field advantage British releases. At a whopping 444 pages, no stone is left unturned. 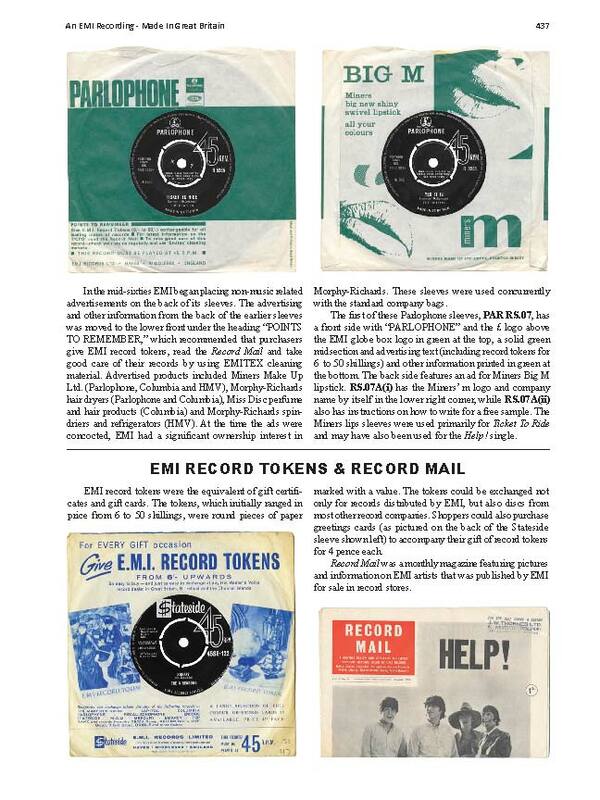 Singles, albums, and the decidedly UK favored “EP” (extended play) records are examined, as are certain export singles and issues of the pre-EMI Hamburg session material. As with the “US” themed books, rare titles such as the original unreleased Get Back album and the Christmas fan club album (here, titled From Then To You) are covered as well. 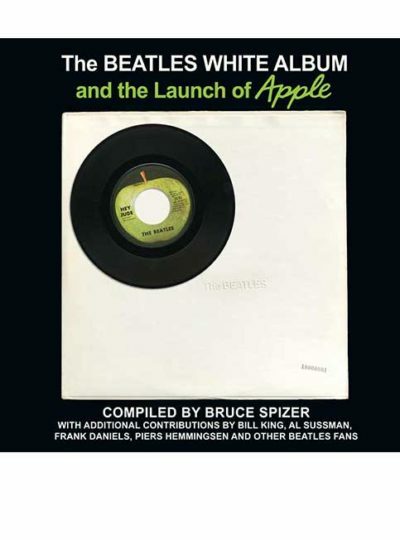 Before singing any further praises of the book content, in the interest of full disclosure it must be stated that I was among the proof-readers helping Bruce on this latest work, as was frequent Brunch contributor (and Beatlefan Magazine Executive Editor) Al Sussman. That little disclaimer out of the way – in the spirit of Bruce’s “other” life as a tax lawyer – let’s continue. As with previous outings, a well-placed foreword has been secured, this time from NEMS and Apple associate Tony Bramwell. Beatles press agent Tony Barrow gets in on the fun, too, with an endorsement (shall we say) quite reminiscent of his liner notes found on the rear sleeve of 1963’s The Beatles Hits EP. That the volume is profusely illustrated with label & sleeve images will come as no surprise to readers of Spizer’s previous books; this time around, artist Eric Cash has been enlisted to flesh out the work with some brilliant and unique images. Once again, Spizer has managed to balance the minutia necessitated by collectors, insights treasured by fans, and aesthetics demanded by more casual readers. While not intended to be a cover to cover excursion, the book is nicely segmented among formats (singles, albums, EP’s, etc) and by individual release within the respective sessions. Even die-hards and “well-read” Beatle fans will find something new to revel in here – for me, it was the examinations of the off-the-beaten-path material such as the Christmas Album and even the Collection of Beatles Oldies compilation from the mid-sixties. 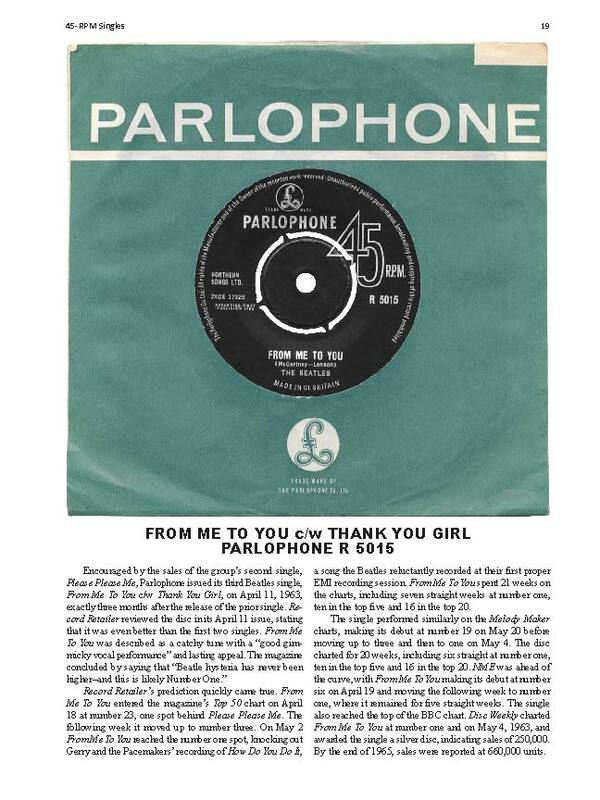 Set for publication on October 5, 2011 (the 49th anniversary of the Beatles first EMI single “Love Me Do” c/w “P.S. 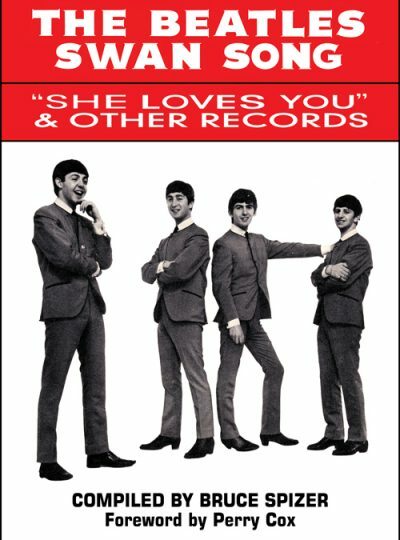 I Love You”, advance copies will be available at the Chicago Fest For Beatles Fans in August. List price of the book is $70 (only a bit steeper than previous editions, but quite reasonable given the over-sized content). Bearing the Beatles For Sale sleeve on the cover, it is available in both “mono” and “stereo” editions. Yes, you read that right, and NO it does NOT mean one covers the stereo versions and one covers the mono versions of the records. It’s just a slightly alternate cover. The content of the books is identical. Me, I’m a mono guy. As with previous volumes, certain “extras” are available, catering to the collector. 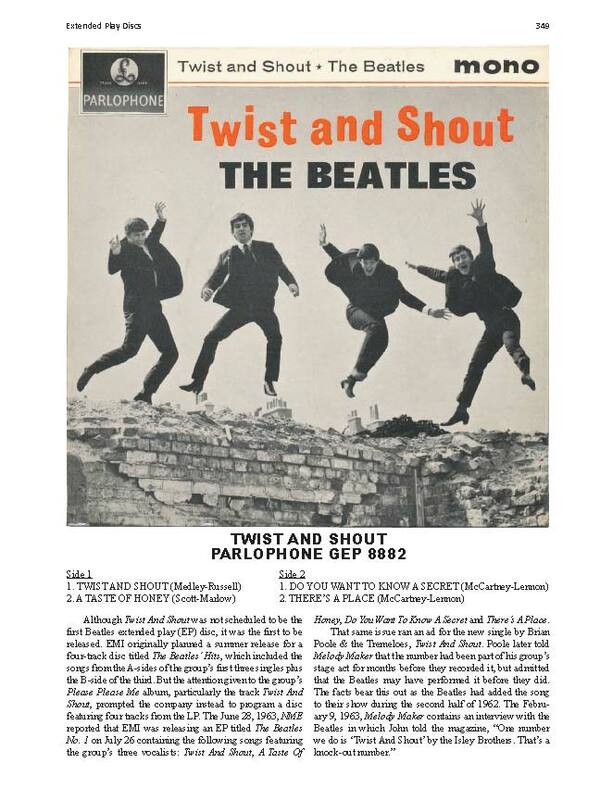 A sturdy slip case is available for an extra $20 (highly recommended, given the size and weight of the book), which handsomely presents the “Paperback Writer” label on the front and red “Please Please Me” single on the rear. Beyond that, a deluxe edition is available for $150, which includes the slipcase, as well as a 2-page fold out poster of the Parlophone LP and EP sleeves, a custom bookmark, an 8 ½ x 11” portrait by Eric Cash depicting a scene from the “Hey Jude” promotional clip, and a two-sided “Penny Lane” / “Strawberry Fields Forever” advert, as depicted in the book. Spizer’s books have become highly treasured volumes by Beatles fans worldwide, and this volume will no doubt be prized as well. As the books are produced in fixed quantities, once they’re gone, they’re gone. Sold out editions (like the Vee-Jay book) command several hundred dollars – when you can find them – on Ebay and collectors sites. As this volume is more comprehensive, covering the entirety of the Beatles active recording career (1962-1970) it makes for a “must have” on your Beatles bookshelf. Bruce Spizer is one of the foremost Beatles authors when it comes to the subject of Beatles record releases in the US. 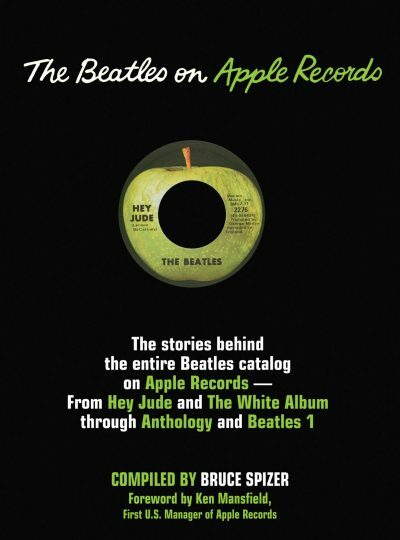 His seven books, (“The Beatles Records on Vee-Jay”, “The Beatle’s Story on Capitol Records” – parts 1 & 2, “The Beatles on Apple Records”, “The Beatles Are Coming!”, “The Beatles Solo on Apple Records”, “The Beatles Swan Song”) have set the bar for almost obsessive accuracy in research, leaving no minutia uncovered. Most of Spizer’s previous books have concentrated on US releases, be it Vee Jay, Capitol, Swan, etc. 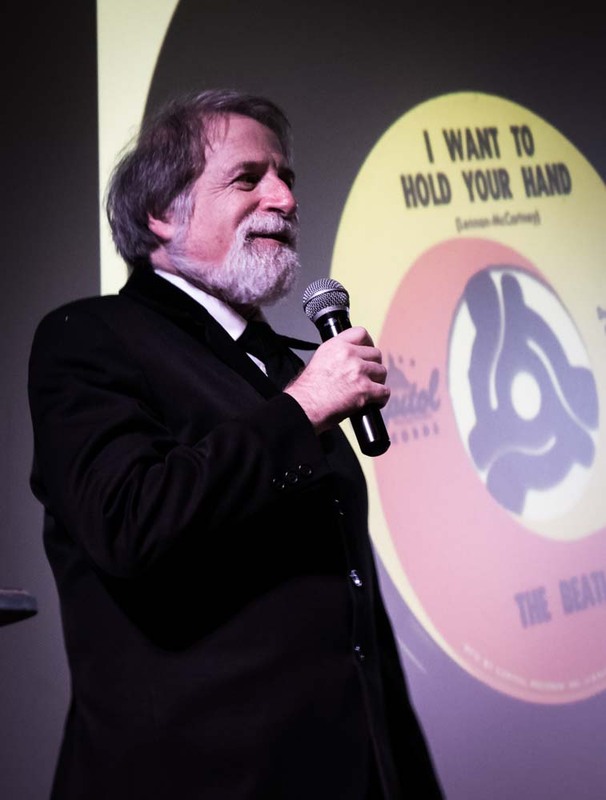 With his 8th book, “Beatles for Sale on Parlophone Records”, he comes full circle. Now the concentration is on the UK releases: 45 rpm singles, extended play records, and albums. This book is probably Spizer’s most important book, Since the UK releases were truly “as nature intended” and the only officially sanctioned Beatles records. As in his previous books, the same format is followed: release dates, label variations (including photos), recording dates and the stories behind the songs, and chart performances. 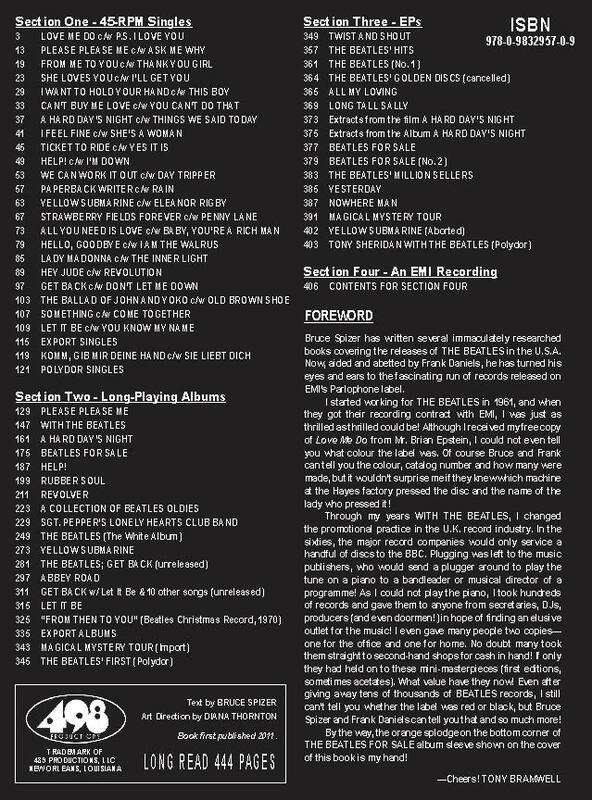 Also included is a portable 25-page checklist of all UK Beatles records with all label variations listed. In Spizer’s attention to detail, the aborted “Yellow Submarine” EP is discussed in the EP section, along with a computer-generated “what if” cover. 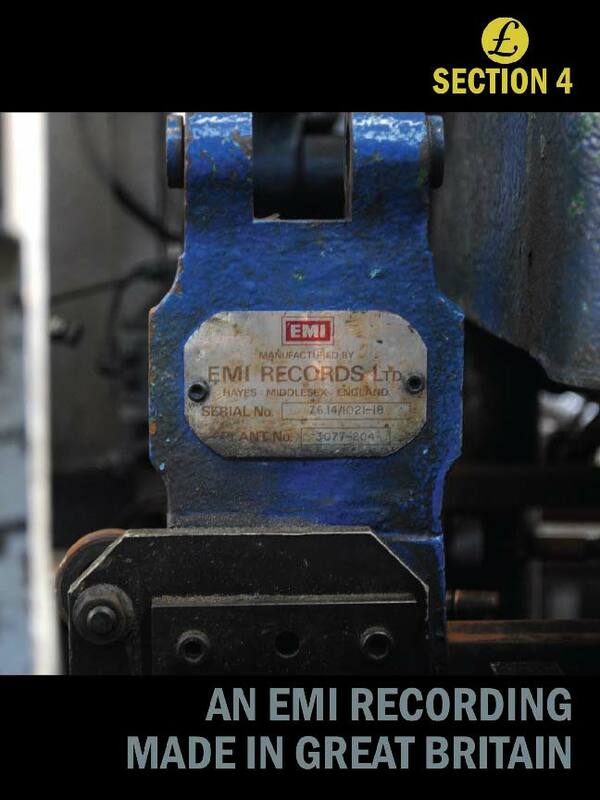 Finally, there is a section covering the history of EMI, including the manufacture of 33-1/3 long playing albums, 45-rpm singles, and the labels themselves. The orange blog on the cover of “Beatles For Sale” is actually Tony Bramwell’s hand – as he was holding back tree branches for the photo shoot. 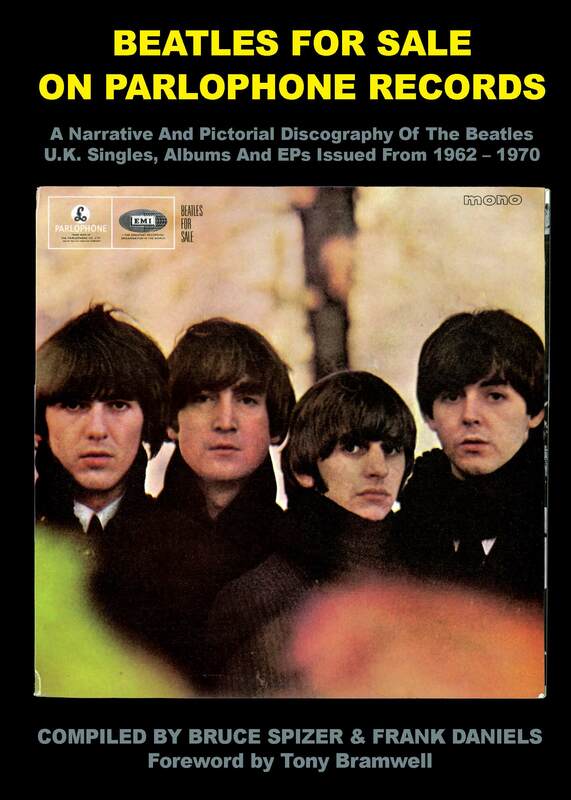 The back photo on “Beatles For Sale” is not a simple picture – The Beatles image was cropped and superimposed over a background of leaves. The “Help” cover wasn’t shot on location for the movie – but rather it was taken at Twickenham Film Studios on a specially constructed platform. Part of the “Rubber Soul” cover was airbrushed to hide a loose thread on John’s jacket. However, the untouched photo still made the cover of some releases, such as Argentina! And then there are the photos! Those familiar with Spizer’s Beatle tomes have come to expect the full-color pictures (many of them unseen in color before). While some of the photos are again the inevitable repeats, there are a few new ones, such as the previously mentioned “Rubber Soul” original cover; Paul’s original lyric sheet for “Lovely Rita”; The Russian “Sgt. Pepper” complete with a Russian-ized drum and the added Beatles fan in the crowd (actually, the owner of the Russian Anfon label, Andre Tropillo); and the cover of “Disc and Music Echo” showing an alternate “Butcher” shot. New is the superb artwork of Eric Cash (ericcashillustration.com) and his excellent renderings of the Beatles. 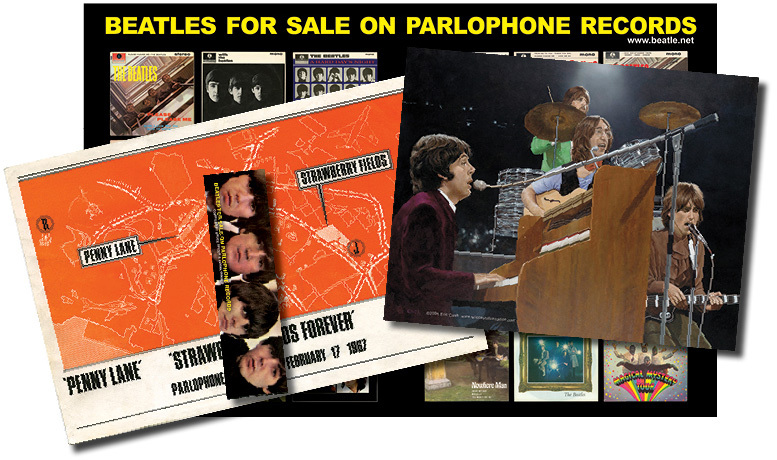 Having information from his previous books available in ONE book alone makes Bruce Spizer’s, “Beatles for Sale on Parlophone Records” a vital addition to any Beatles library. At 444 pages (plus the insert), this could be the most important book documenting Beatles’ records. his thorough research into lesser-known areas of their history. From the group’s beginnings on such small American labels as Swan and Vee-Jay to an in-depth look at the 1963-1964 US Beatlemania marketing campaign, Spizer researches particular, previously hidden corners of the Beatles’ story. His newest book, Beatles for Sale on Parlophone Records (co-written with Beatles historian Frank Daniels), thoroughly examines the UK album, EP, and single releases, which can be a source of confusion for those accustomed to the American releases. While some information may be overly technical for some fans, the “behind the scenes” stories of the Beatles’ vast music catalog should interest all Fab Four enthusiasts. 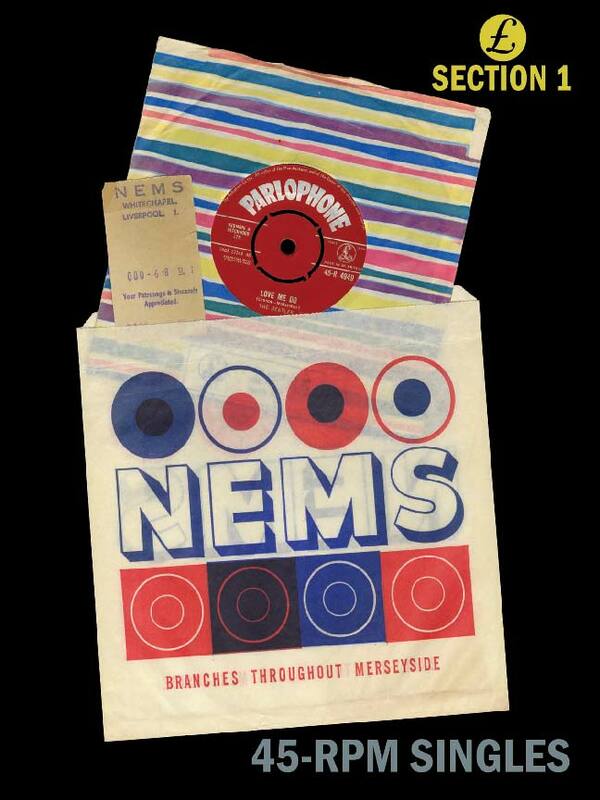 which details the history of Parlophone/EMI. Tidbits include revealing the song on which Lennon based “I Feel Fine’s” guitar lick, the origins of that orange smudge on the bottom of the Beatles for Sale album cover, and how “Happiness Is A Warm Gun” was written and recorded. While Spizer does not detail every difference between British and American releases-that would constitute its own book-he does clarify how each UK album was carefully designed and compiled. Ever wonder about the history of the Fan Club Christmas Records? These are covered here, too. 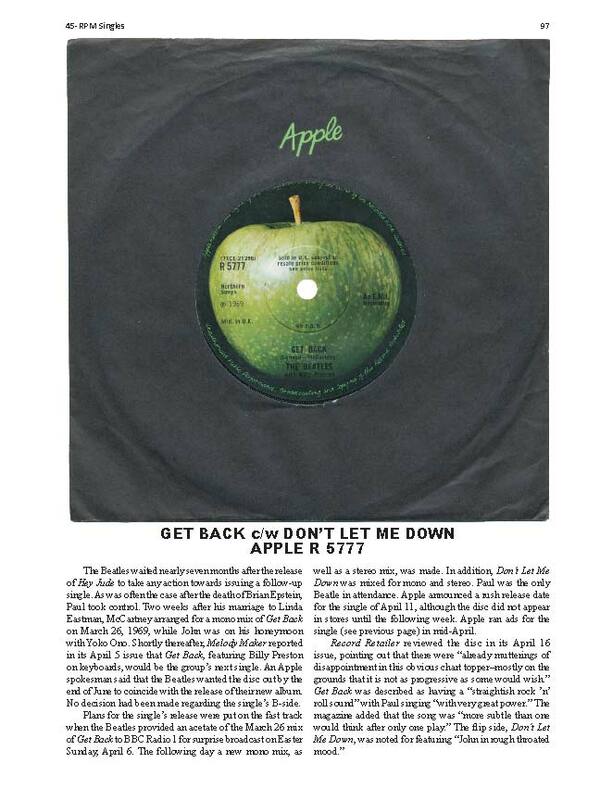 Why was “Strawberry Fields Forever” not included on Sgt. Pepper’s Lonely Hearts Club Band? Spizer addresses that question and many more. Rare photos of the group, original advertisements, and other ephemera grace the pages. The second book that inhabits this tome is intended for hard-core record collectors. 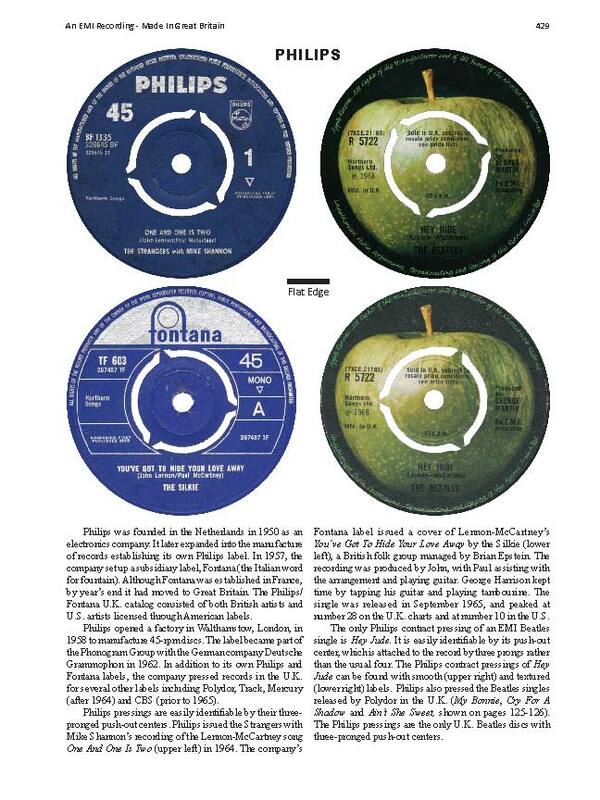 Numerous full-color photos illustrate how the Parlophone/EMI (and later Apple Corps) labels differ from one another. Every color, misspelling, logo, number-Spizer chronicles every label variation imaginable. Researcher Daniels helped compile the data, which serves as essential information for anyone interested in owning every LP, EP, and 45 possible. As Spizer notes in his introduction, he realizes that not all Beatles fans will find these parts of the book fascinating. Therefore he recommends skipping those sections, although record collectors should find the photos, lists, and descriptions of various labels invaluable. 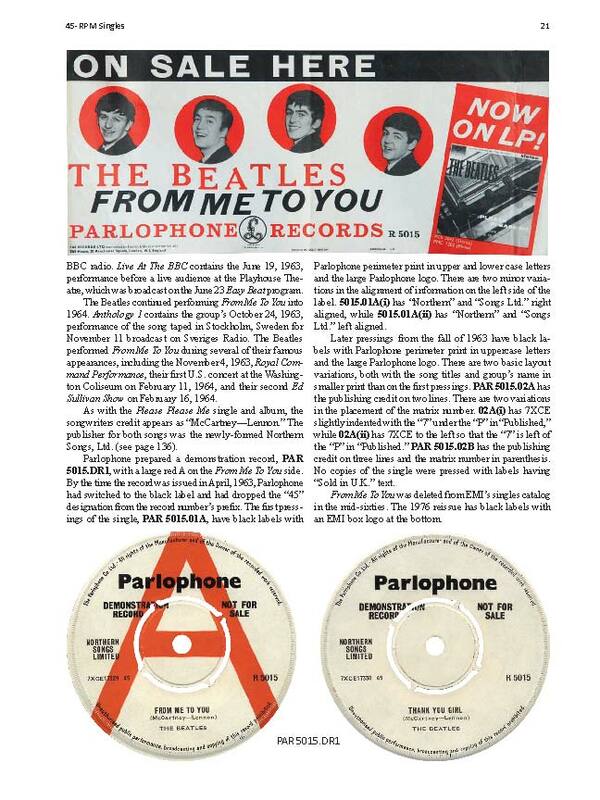 However, it is not necessary to read those “hard-core” sections to enjoy Beatles for Sale on Parlophone Records. Accompanying the book is a glossy booklet entitled Check List and Valued Vendors, tucked into a replica of a 45 sleeve. Again, this version on an appendix should appeal mainly to collectors, as it lists catalog numbers, pressings, and other highly technical statistics. While Spizer’s books can be expensive?$70 or so-their abundance of information make them essential additions for any Beatle fan’s library. 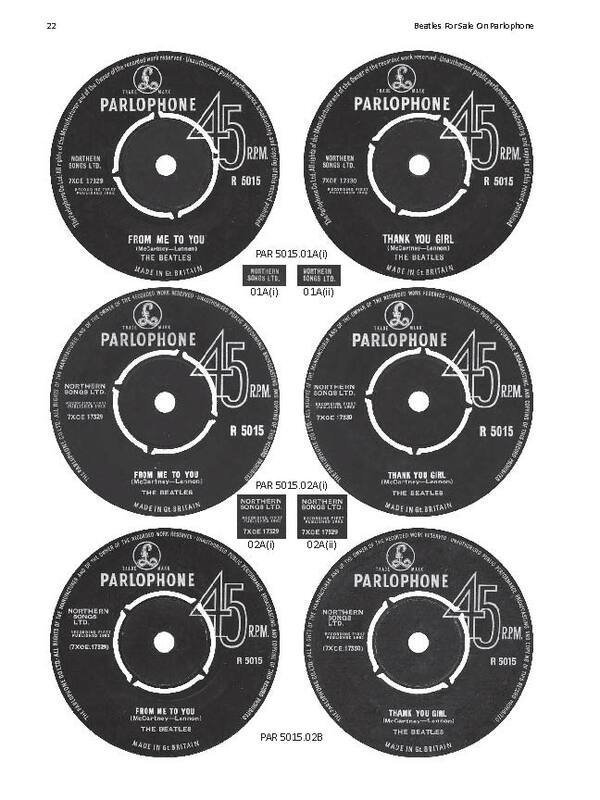 Beatles for Sale on Parlophone Records continues his pattern for producing painstakingly researched and designed reference tools for intermediate to advanced hobbyists. 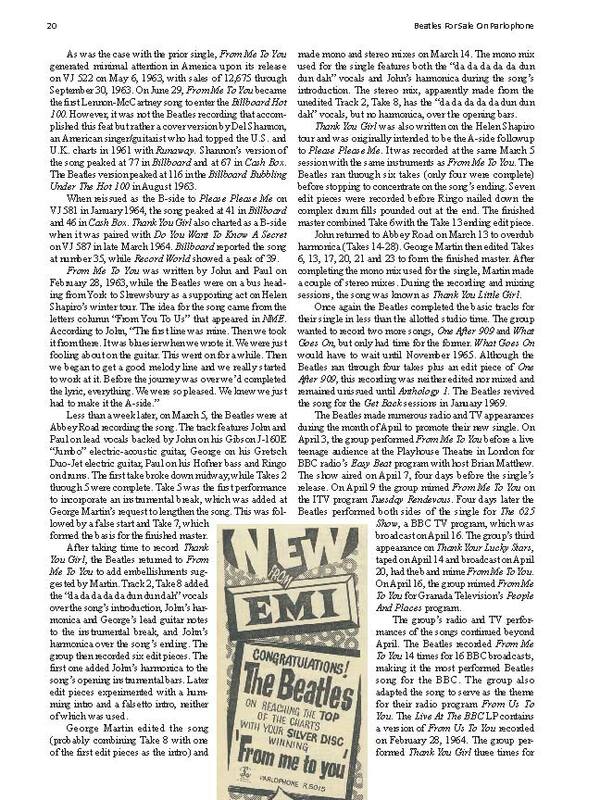 Like Mark Lewisohn, Spizer has deservedly earned the reputation for being a top Beatles historian and a trusted resource. His latest book follows in this tradition, and is well worth the price. Beatles for Sale on Parlophone Records will be published October 5, 2011, but pre-orders are accepted at Spizer’s website. 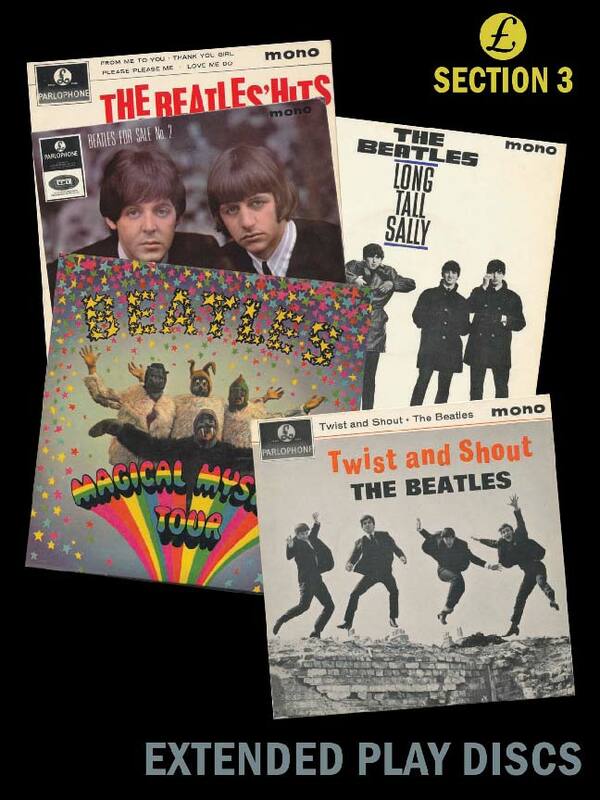 The hardcover book is also available in two limited editions: the slipcase edition, which is numbered and includes the author’s autograph; and the collector’s edition, which includes the slipcase, a poster, replica of a vintage Beatles promotional card, a bookmark, and a limited edition print. Spizer had thought that “The Beatles Swan Song” (released in 2007) would be his last book. Instead, he’s getting ready to publish another one, “Beatles For Sale on Parlophone,” written in collaboration with Frank Daniels (whose “Price Guide For The Beatles American Records” was published in 2007 by Spizer’s company, 498 Productions). “This is a massive undertaking,” Spizer adds, with no exaggeration. Covering the U.K. records pressed by EMI incorporates not just the 22 singles released in the U.K., but also those pressed for export sale; an extensive section on EPs (including two that were never issued); the 13 U.K. albums (including the two unreleased “Get Back” albums) and export albums; and the Christmas album. along with the fan club discs. No surprise then that book runs to 444 pages. When it comes to Beatles books, there’s no shortage of supply, no matter what your level of interest. 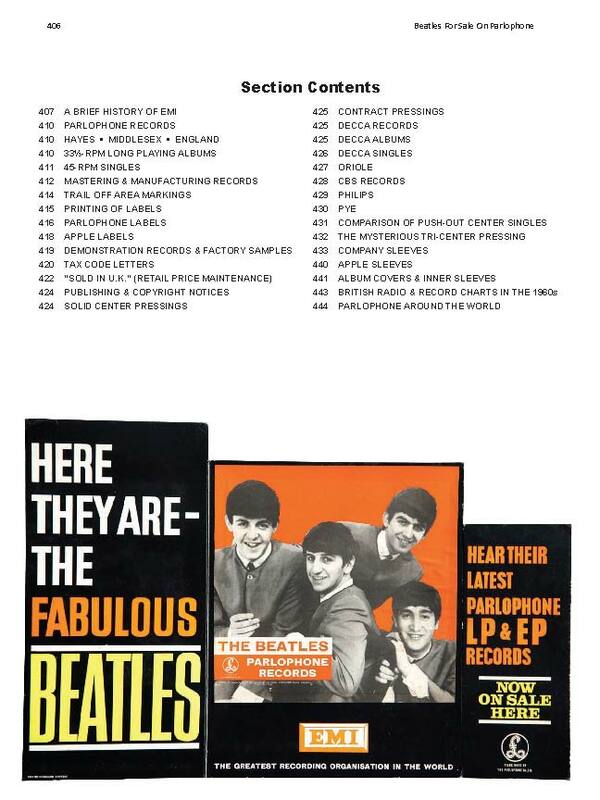 For the typical Beatles fan, there are compendiums like the Beatles Anthology. For serious Fab Four devotees, there are lovingly researched tomes like Mark Lewisohn’s Recording Sessions and Andy Babiuk’s Beatles Gear. For the rest of us obsessives, there is Bruce Spizer and his canon of books devoted to minutiae about the group’s records. A lawyer by trade, Spizer pursues his love of all things Beatles with an exhaustive — some might say compulsive — level of research and analysis. Beginning with The Beatles Records on Vee-Jay in 1998, Spizer has written six volumes that document the group’s group and solo releases, detailing not only the making of the songs and albums but also minor variations in sleeve and label printings from one pressing factory to another. He also tackled Beatlemania in The Beatles Are Coming, in which he documented, in typical exacting detail, the recordings, performances and behind-the-scenes deals surrounding the group’s American breakthrough. 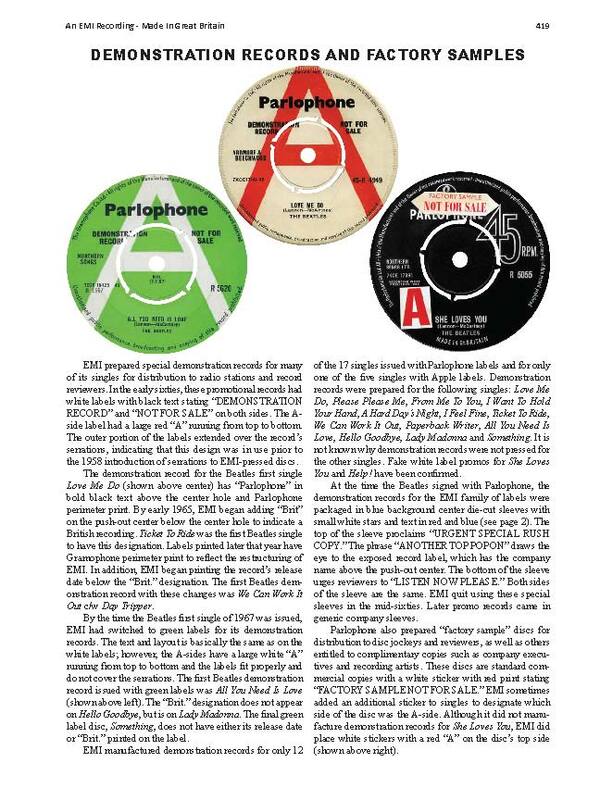 Now comes the latest — and reportedly last — book in Spizer’s series: the 444-page Beatles for Sale on Parlophone Records, which covers all of the Fab Four’s singles, albums and extended-play discs issued in the U.K. from 1962 through 1970. Spizer and co-author Frank Daniels go even further than the title states by including details about the group’s Apple albums and singles, Fan Club Christmas discs (the Beatles issued a holiday “greeting” through the club every year from 1963 through 1969) and Polydor releases of their Hamburg-era recordings. As you might guess given Spizer’s previous books, the depth of information is satisfyingly comprehensive. In addition to telling the stories behind the songs and albums, Spizer and Daniels explain how the records are mastered and manufactured, how they were marketed and how they performed on the British radio and record charts. But the real treat here is in the pictures. As with his other publications, Spizer has richly illustrated the new volume with hundreds of color and black-and-white photos. There are the requisite shots of album covers and sleeves of 45s and EPs. But the real eye candy here is the pictures of rare promotional materials that EMI used in its publicity efforts, reminders of the marketing machinery behind the Beatles’ pop-culture juggernaut. 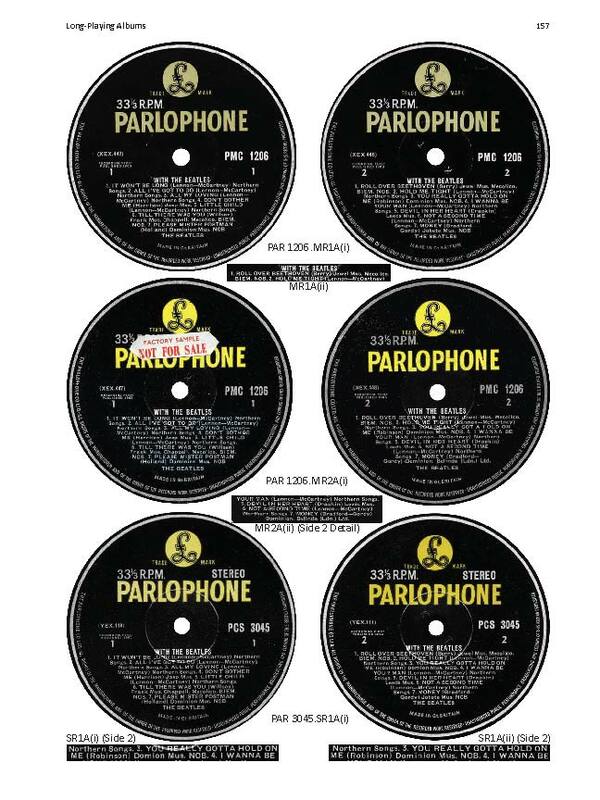 The Beatles for Sale on Parlophone Records will be released October 5 and is available now for preorder from Beatle.net. 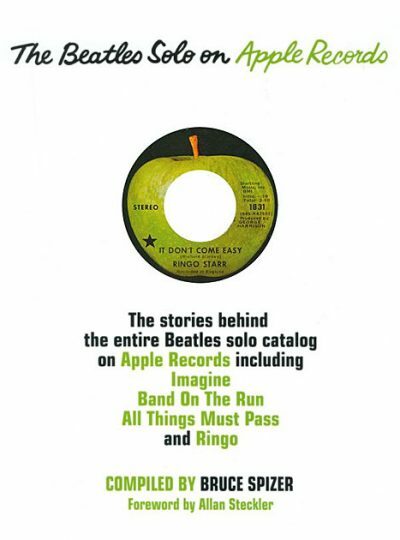 The book is offered in three versions: book only ($70), a signed and numbered slipcase edition ($90), and a collector’s edition ($150) with slipcase, poster, limited-edition print, a replica of a historic Beatles promotional card and a bookmark. 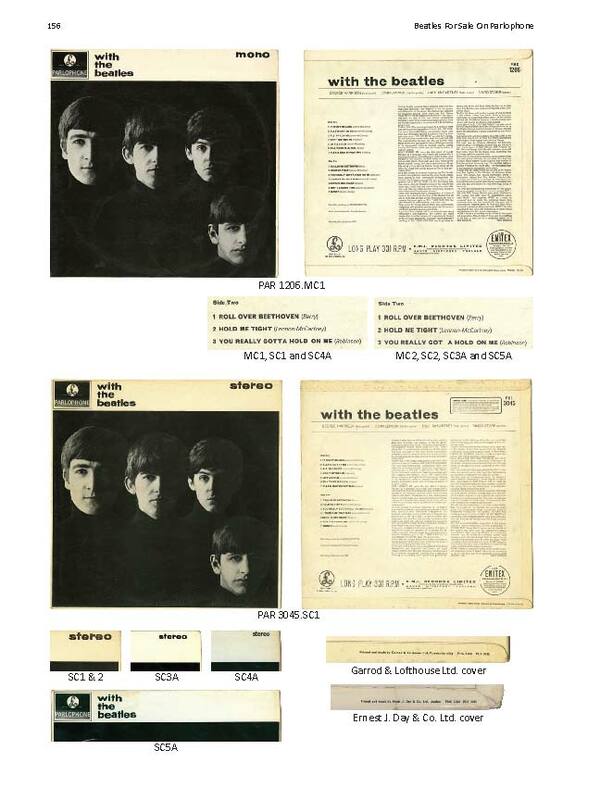 The book itself features the cover of the group’s 1964 Beatles for Sale album, and you can choose between “stereo” and “mono” versions (the contents is the same). 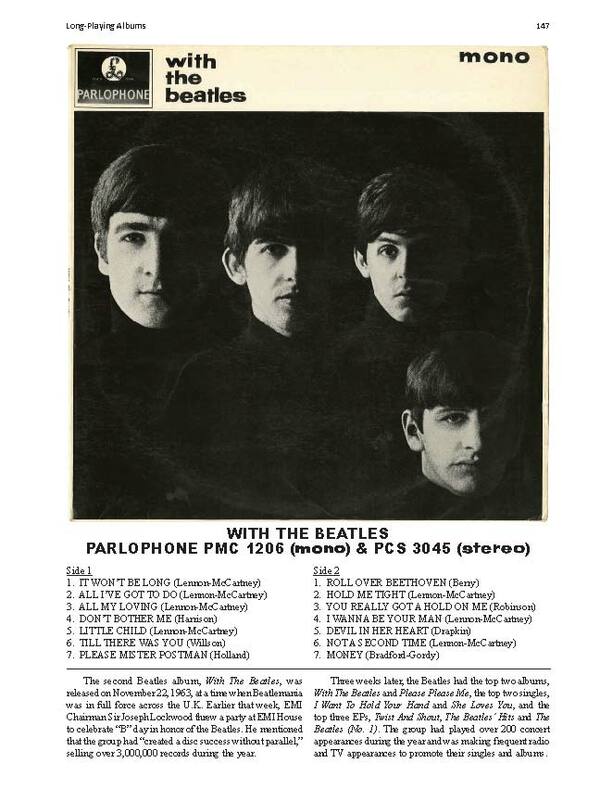 Beatles fanatics, take note: the mono versions are outselling the stereo versions. Get yours while they last. Christopher Scapelliti is the executive editor of Guitar World magazine and managing editor of Guitar Aficionado.